Property Note: Sitting high on the bluffs off the shores of Lake George sits this one of a kind 2 bed 1 bath cabin. The views over the lake and the sunsets off the prairie are priceless. You won’t find better water views anywhere in ND. The well built and maintained cabin is turn-key and is ready for your summer getaways, hunting/fishing trips or business retreats. 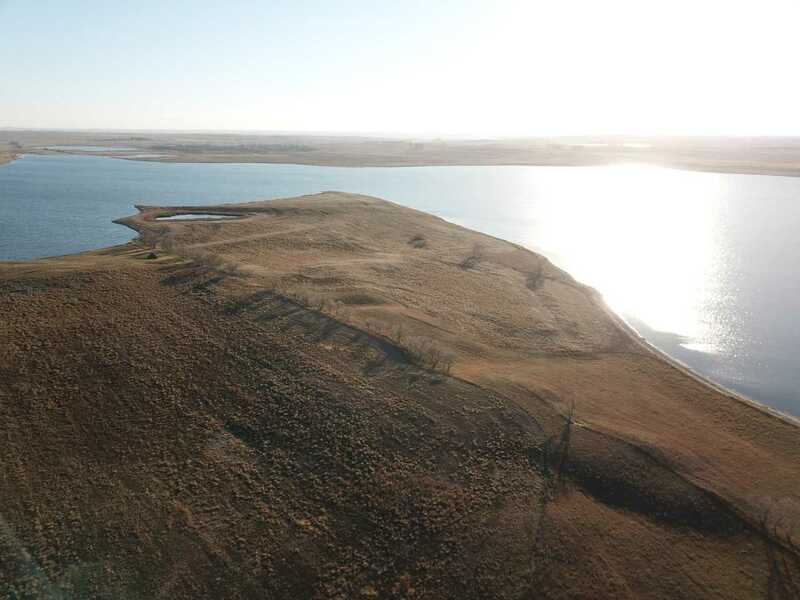 The amount of acreage you have here allows you endless opportunities not only for peace and quiet but for developing the mile plus of lakeshore, farming the tillable acres, pasturing for horses or cattle or building your dream home. The options are endless. The lake is the deepest lake in ND at 150ft and one of the cleanest I have seen anywhere. The hard sand beaches and crystal clear blue waters are in part to it being a saltwater lake, but also due to the lack of traffic and people that have access to the waters. The wildlife that calls the property home, include whitetail deer, pheasants, waterfowl, grouse, turkey and coyote. The property is part of the Lake George game refuge and is located only 10 miles off of I-94 within a close distance to Bismarck and Jamestown. *Please Note: This property sits in the Lake George Game Refuge, and the only hunting that can be done right now on the property is for predators. The current owner has talked with game and fish, and the new owner could petition to have the property removed from the refuge for hunting purposes if they chose to do so. Contact: Darin Peterson at 701.220.5396 for more information or Pifer’s Auction & Realty at 877.700.4099 for a complete catalog. Driving Directions: From Interstate 94: Take Exit 221 and turn south onto 47th Ave SE. Drive for 10 mile and turn west onto 47th St SE. This will be a dead end road leading into the property.